One of the most common questions we are asked when working on kitchens is ‘how do I choose a worktop?’ The kitchen worktop is one of the most hardwearing items you need in a new kitchen so it must be robust and suitable for your needs, as well as matching the overall design in terms of looks and style. The worktop choice may be influenced by the type of kitchen, for example, for an ultra-modern kitchen you may consider an on trend option such as stainless steel or concrete. 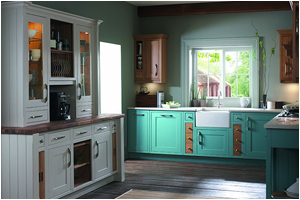 For a traditional kitchen you may start by looking at a wood worktop. In both of these cases, the real materials do require some care to maintain but there are ‘look- alike’ options available that are easier to care for and cheaper. For most people the choice is between a good quality laminate and a more expensive granite, composite or solid surface worktop, and these are the most popular choices with our customers. We often start by looking at the three main elements of the kitchen, the worktop, cabinets and flooring – these three should work in harmony and all blend well or contrast as required. If the aim is a warm neutral colour scheme then a composite material such as quartz may work best as the colour options tend be lighter than for granite. A composite worktop is made from about 90% natural quartz crystals mixed with a small percentage of binders. This material is very tough, virtually non-porous and resistant to scratches, stains, heat damage and impact. As with a natural material such as stone or granite, these do have joints and need specialist fitting so they are not usually any cheaper than granite. A Corian or solid-surface worktop can be totally seamless with one-piece installation and moulded sinks and splashbacks. These worktops are made from a blend of acrylic resins, minerals and colourings. They are particularly suited to designs where curves and fluid lines are required. Solid surfaces are stain and water resistant. They’re also heat-resistant but it pays to take care and protect the worktop from hot pans. As it is a solid surface material, like hardwood, scratches can be sanded out. Granite is often top of the wish list and for good reason, it is a beautiful natural material, with every piece being unique. Granite comes in so many variations that it is easy to find a colour and pattern that works with every kitchen, from traditional to contemporary. The finish can be polished and glossy or matt for a softer look. Granite is hard and resistant to heat and scratches, but it must be treated with respect to prevent damage. It can withstand high temperatures, is water resistant and impervious to most stains, but wine and citric acids must be cleaned up at once to avoid damage. A good quality laminate can be an option if the other alternatives are outside of your budget. They can be cost effective and versatile. They can be made to look like a more expensive material and will be easy to maintain and clean. 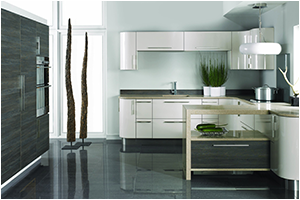 There is a huge choice available, so it is easy to find one that enhances your kitchen design. You’re going to be using your worktop everyday so it’s important to take the time to do your research and choose a style you like the look of, as well as a surface that will suit your lifestyle. We have several examples on display in the showroom and a wide selection of samples, why not call in and find out more.